India Arie (sometimes styled as India.Arie, born India Arie Simpson, October 3, 1975) is an American singer-songwriter, actress, musician, and record producer. She has sold over 3.3 million records in the US and 10 million worldwide. She has won four Grammy Awards from her 21 nominations, including Best R&B Album. She was born in Denver, Colorado, the daughter of Joyce and Ralph Simpson. Her musical skills were encouraged by both parents in her younger years. Her mother is a former singer (she was signed to Motown as a teenager and opened for Stevie Wonder and Al Green) and is now her stylist. Her father is a former NBA basketball player. She has an older brother named J'On. According to a DNA analysis, she descends from the Mende people of Sierra Leone, the Kru people of Liberia and the Fula people of Guinea-Bissau. After her parents divorced, Simpson's mother moved the family to Atlanta, Georgia when she was thirteen. Simpson had taken up a succession of musical instruments throughout her schooling in Denver, but her interest in the guitar while attending the Savannah College of Art and Design, in Savannah, led to a personal revelation about songwriting and performing. "When I started tapping into my own sensitivity, I started to understand people better. It was a direct result of writing songs", she said at the press release of her debut album, Acoustic Soul. Co-founding the Atlanta-based independent music collective Groovement EarthShare (Groovement was the collective artists' name and EarthShare was their independent label name), her one-song turn on a locally released compilation led to a second-stage gig at the 1998 Lilith Fair. In 1999, a Universal/Motown music scout signed her and made an introduction to former Motown CEO Kedar Massenburg. Arie resides in Atlanta, Georgia. Arie released her debut album Acoustic Soul on March 27, 2001. The album was met with positive reviews and commercial success. "Acoustic Soul" debuted at number ten on the U.S. Billboard 200 and number three on the Top R&B/Hip-Hop Albums. Within months, without the concentrated radio airplay that typically powers pop and rap albums, Acoustic Soul was certified double platinum by the Recording Industry Association of America (RIAA), selling 2,180,000 copies in the U.S. and 3,000,000 copies worldwide. The album was also certified Gold by the British Phonographic Industry and platinum by Music Canada. The album was promoted with the release of the lead single "Video". "Video" attained commercial success peaking at forty seven on the US Billboard Hot 100 and becoming her highest charting song in the region to date. The album's second single "Brown Skin" failed to chart on the Billboard Hot 100, but it became her highest charting single in the United Kingdom, peaking at number 29. Arie performed a duet with rock singer-guitarist John Mellencamp on the song "Peaceful World" for his 2001 album Cuttin' Heads. While Arie and the album were nominated for seven Grammy awards in 2002, they won no awards, losing in five of seven categories to Alicia Keys. She closed the ceremony with a performance of her song "Video". Arie performed a duet with jazz singer Cassandra Wilson on the song "Just Another Parade" for her 2002 album Belly of the Sun. Arie followed the success of her debut on September 24, 2002 with the release of Voyage to India. It debuted at number six on the Billboard 200 with first week sales of 109,000 copies and topped the Top R&B/Hip-Hop Albums, with the RIAA certifying it Platinum. At the 2003 Grammy Awards, it won Best R&B Album, and the single "Little Things" won Best Urban/Alternative Performance. The song "Get It Together" was featured on many film soundtracks including Brown Sugar (2002) and Shark Tale (2004). On September 12, 2005, Arie performed "Just 4 2day", a song written for her appearance on the debut of The Tyra Banks Show. She also performed "What About the Child", a song that did not air but was made available as a one-dollar Internet download to support child victims of Hurricanes Katrina and Rita. Arie is also featured on Stevie Wonder's album A Time to Love, released on October 18, 2005. Arie and Wonder duet on the title track "A Time to Love", written by Arie, which was nominated for Best Pop Collaboration with Vocals at the 2006 Grammy Awards. Three years earlier, their rendition of Mel Tormé's 1944 classic "The Christmas Song", recorded for the holiday TV commercial for retailer Target, had been nominated for the same category, making it the first song created and financed exclusively for a commercial to be nominated for a Grammy Award. Arie's third studio album, Testimony: Vol. 1, Life & Relationship, was released on June 27, 2006. It gave Arie her first number-one spot on the Billboard 200 and was her second chart-topper on the R&B charts. This album was also the first number-one album for Motown in twelve years . Its first-week sales of 161,000 copies are Arie's best sales week to date and was certified gold in August 2006, selling 730,000 in US and 1,300,000 worldwide. "I Am Not My Hair", a collaboration with Akon, was the most successful release from Testimony: Vol. 1., reaching the U.S. Billboard Hot 100 at #97 and the UK Singles Chart at #65. On the April 16, 2007 episode of The Oprah Winfrey Show entitled "After Imus: Now What? ", Arie guest-starred as a panelist. Arie performed a duet with singer Anthony David for his song "Words" for his 2008 album Acey Duecy. Her next album, Testimony: Vol. 2, Love & Politics was released on Tuesday, February 10, 2009. It debuted at No. 3 on the Billboard 200, and No. 2 on the R&B chart. Within this CD, Arie collaborated with such artists as Sezen Aksu, Keb Mo, Gramps Morgan and Musiq Soulchild to fulfill her self-proclaimed desire to "do projects with people who are making music that is meaningful, with a lot of integrity and a lot of sonic diversity". Arie also identified this CD as her first to write and sing songs without worrying about public opinion after a much-needed vacation to Hawaii. The album was her first produced and released after her departure from Motown to Universal Records. Arie performed "Video" with British singer Adele at the 2009 VH1 Divas. Arie is one of over 70 artists singing on "We Are the World: 25 for Haiti", a charity single in aid of the 2010 Haiti earthquake. Arie contributed vocals to "Imagine" for the 2010 Herbie Hancock album, The Imagine Project along with Seal, P!nk, Jeff Beck, Konono N°1, Oumou Sangare and others. In the fall of 2010, she was a featured guest vocalist on Carlos Santana's version of The Beatles classic song "While My Guitar Gently Weeps" from his album Guitar Heaven. The song also features Yo-Yo Ma on cello. In September 2012, she featured in a campaign called "30 Songs/30 Days" to support Half the Sky: Turning Oppression into Opportunity for Women Worldwide, a multi-platform media project inspired by Nicholas Kristof and Sheryl WuDunn’s book. In March 2013, it was announced that Arie was working on her upcoming fifth studio album, Songversation, which was released on June 25, 2013. The first single of the album, "6th Avenue", was released on iTunes on November 4, 2012; it was produced by India Arie and Israeli musician Idan Raichel. The second single "Cocoa Butter" was released on iTunes on April 9, 2013. In 2015, she released a collaborative album with musician Joe Sample titled Christmas with Friends. In July 2016, she premiered her new single "Breathe" inspired by the Black Lives Matter Movement, especially Eric Garner's last words. She also announced a new album titled Worthy was in the works. She performed the single on the Soul Train Awards with host Erykah Badu in November. India Arie on the red carpet VH1 Divas 2009. The Grammy Awards are awarded annually by the National Academy of Recording Arts and Sciences. Arie has won four awards from twenty-one nominations, including Album of the Year, Record of the Year, Song of the Year and Best New Artist. In 2002, she got the record of "Most Nominations in One Night Without Winning", with seven received nominations. 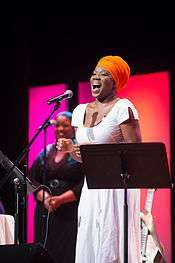 In 2009, India Arie portrayed Nina Simone in a staged reading at the Roundabout Theatre Company of the upcoming Broadway musical "Soul Doctor", about the life of Shlomo Carlebach written by Daniel Wise. ↑ "On A Spiritual And Emotional Journey – India.Arie And Her Music". EF News International. Retrieved 2011-10-28. ↑ "The soul of a songwriter: India.Arie talks about reading, writing and stoking her creative fires". Black Issues Book Review. September–October 2004. Retrieved 2007-05-05. 1 2 "India.Arie MTV biography". MTV. Retrieved 2007-10-15. ↑ "India.Arie Ancestry Reveal". YouTube.com. Retrieved 2013-02-21. ↑ "Growing Interest in DNA-Based Genetic Testing Among African American with Historic Election of President Elect Barack Obama". Prweb.com. Retrieved 2013-02-21. ↑ Duffy, John. "Acoustic Soul – India.Arie". Allmusic. Retrieved on 2009-08-12. ↑ "RIAA – Gold & Platinum – December 13, 2010: Acoustic Soul certified awards". Recording Industry Association of America. Retrieved December 13, 2010. ↑ "British Phonographic Industry search results". British Phonographic Industry. Archived from the original on September 24, 2009. Retrieved December 13, 2010. ↑ "Gold & Platinum Certifications". Music Canada. Retrieved July 5, 2013. ↑ "India.Arie Album & Song Chart History – Hot 100". Billboard. Retrieved December 13, 2010. ↑ "India.Arie – Voyage To India". Discogs.com. 1 2 "Voyage to India - India.Arie". Billboard.com. ↑ "India Arie – Voyage To India CD". CDUniverse.com. ↑ "Soundtracks for Brown Sugar (2002)". IMDb.com. ↑ "Soundtracks for Shark Tale (2004)". IMDb.com. ↑ "Telepictures Productions". Tyrashow.warnerbros.com. Retrieved 2013-02-21. ↑ "Tyra Banks & India.Arie". iAmplify. December 8, 2005. Retrieved 2007-03-06. ↑ "Brian McKnight, Marc Anthony & More On Stevie Wonder Tribute Collection". Spotlight on R&B. February 9, 2003. Retrieved 2007-06-01. ↑ "The Imagine Project". All About Jazz. 2010-06-21. Retrieved 2010-11-29. ↑ "30 Songs / 30 Days for Half the Sky | Half The Sky". Halftheskymovement.org. 2012-08-30. Retrieved 2013-02-21. ↑ Cooper, Charlene. (2013-03-22) Must-Listen: Hear India Arie's New Song, 'Cocoa Butter'. Essence.com. Retrieved on 2013-06-25. ↑ India.Arie to Release "SongVersation" on June 25 @ARTISTdirect. Artistdirect.com. Retrieved on 2013-06-25. ↑ iTunes – Music – Cocoa Butter – Single by India.Arie. Itunes.apple.com (2013-04-09). Retrieved on 2013-06-25. ↑ iTunes – Music – 6th Avenue – Single by India.Arie. Itunes.apple.com (2012-11-04). Retrieved on 2013-06-25. Wikimedia Commons has media related to India.Arie.